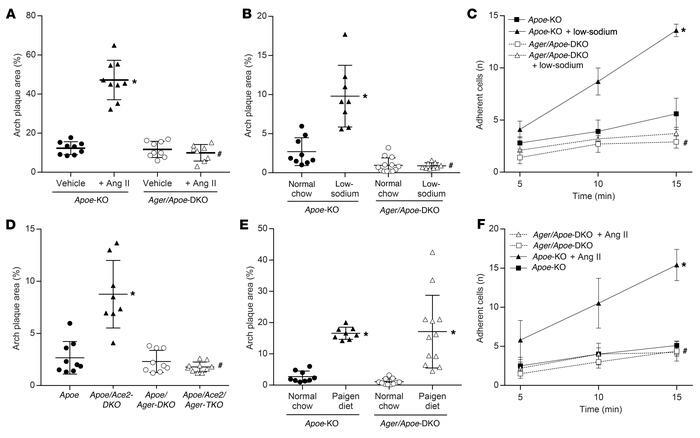 Activation of the RAAS is associated with increased atherogenesis and endothelial activation in Apoe-KO but not Ager/Apoe-DKO mice. (A) Increased plaque area following a 4-week infusion of Ang II (1 μg/kg/min). (B) Increased plaque area following 6 weeks of a 0.05% low-sodium diet. (C) Increased number of labeled leukocytes adhering to the aortic surface as a marker of endothelial activation after 1 week of exposure to a low-sodium diet. (D) Increased plaque area in the presence of genetic Ace2 deficiency. (E) Equivalent increase in plaque area following exposure to a Paigen proatherogenic diet. (F) Increased number of labeled leukocytes adhering to the aortic surface following ex vivo exposure to Ang II (1 μM for 4 h). Data are presented as the mean ± SD. n = 8–10 mice per group. *P < 0.05 versus Apoe-KO mice; #P < 0.05 versus Apoe-KO mice plus RAAS activation (Ang II infusion, low-sodium diet, Ace2/Apoe-DKO). P values were determined by 2-way ANOVA.